It's been a while since I read anything historical I'm not 100% sure why, perhaps it's my love of history and making things as accurate as possible if you want to bring historical facts into a book, thankfully though this book, for me, mixed the much needed facts with fiction perfectly. The year is 1824 and Constable Samuel Plank, works as a policeman attached to the the magistrates’ court in Great Marlborough Street, he has been set the task of arresting banker Henry Fauntleroy - a man charged with Forgery, which back then was a Capital Offense. Sam Plank is a policeman of dignity, while many others of the time would take a bribe and turn a blind eye, he prides himself on upholding the law and while there is little doubt that Henry Fauntleroy is guilty the magistrate John Conan, asks Sam to look into it more. Because why would a gentleman of good stature and seemingly decent nature fall so far as to commit a hangable offense and with Sam having had a previous interest in a forgery case he is just the man for the job. Henry Fauntleroy is adamant he wants to plead guilty, though with London split he could perhaps be saved from the noose this seems to be far from what he wants, but why would a man, with family want to leave this earth? What just is he hiding? I have to say the answer to those questions surprised me - I was sure I knew what was going on from quite early on, but I was so far from the truth. 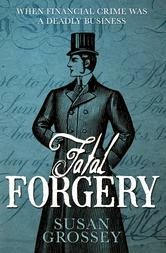 Fatal Forgery is Susan Grossey's first fiction novel, she had previously written many non-fiction books on the subject of money laundering and how not to fall prey to it. Personally I hope this is not her only foray into Fiction I would love to hear more about Samuel Plank in future. I love Historical novels! I find them so fascinating!! This sounds likes a great one! I love reading and historical novels are a big love of mine. This sounds right up my street, shall add it to my reading list! This sounds an interesting novel, wonder what he is hiding? Can you buy it on kindle do you know? I love historical fiction, to think forgery was a capital expense? That makes it more gripping, knowing the accused is fighting for his life.Must look out for it! This looks like an interesting book. Thanks for your thoughts and the review. I love historical movies, books not so much...I'm not sure why.I'll have to see if this is a movie or not! this book sounds wonderful adding it to my reading list. I love a good book set in historical times! This one sounds great and full of suspense. Definitely adding it to my list of must reads! I haven't read many historical book but seems I need to check a few out. This seems like a good read.